I'm still busy as a bee trying to make this house a home. My goal is to enjoy every minute of the decorating process. I've been slowly taking the time to look at all my heirloom's and treasures. Dan and I have decided that we will not move with this much stuff again. We are downsizing and my little Etsy shop will be overflowing with goodness soon. We are only keeping what we love and use everyday. 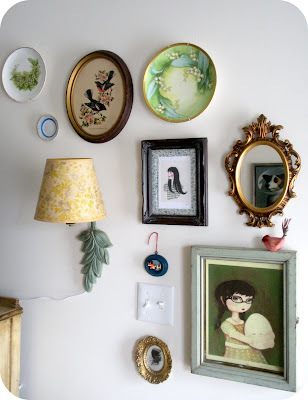 This wall has plates from my Grandmother and Grandfather Holling, a photo of my Great Grandmother, a frame from my Grandma and Grandpa Mclard's farm, treasures that Dan and I found in Mississippi and Washington and some prints from a few of my favorite Etsy shops. The Black Apple and Mateau En Peluche. Did you see my chair? My Mommy found it at an estate sale in Southern California. It was missing a leg but we all thought it was so pretty. My Father-in-law gave it a new leg and now it is my favorite little place to sit for chit chats with Bono Baby. Someday soon I will ask you all to come over to our country cottage for herbal tea. I'm keeping my teacup collection, so there. p.s. Dan is taking me out for date night this evening. I think I am going to dress up. That is a GREAT chair! Love it! love the chair. love the quote! love your wall of treasures. sending you happy weekend wishes. 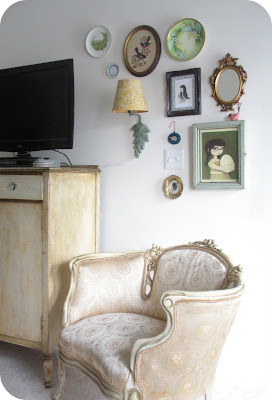 LOVE the chair, and I especially love the print by The Black Apple on your wall. I love her stuff! You have excellent style. It was so delightful to meet you today! If you're bored in Auburn, I happily volunteer my services as local guide. I don't know the Auburn area very well, but I know Opelika some, and I know Columbus well. Maybe we could meet up for jewelry making at Perch? See you later lovely lady! that looks so, so pretty! i have some old dishes that were my great grandma's, and i was so happy when we bought this house because we have glass doors on the kitchen cabinets, so i can show them off! Oh, I love all your little knick-knacks and I especially love your suitcases as a side table. SUCH great ideas! Looks very homey. :) Glad you're settling in. Oh my goodness! Thank you so much! I'm so flattered that you've put me up there with the Black Apple! And your blog! So nice! It's going on my list immediately!! I'll let you know, when i'll be in that area. Maybe, you'll invite me over for a cup of tea. We can seat and chitchat.